From all of us at Sci/Why, may 2014 be full of fascinating science, and many other good things. New Zealand's Antarctic Heritage Trust found some very old negatives in an expedition hut from Capt. Robert Falcon Scott's failed 1912 quest to become the first man to reach the South Pole. The photos were taken during Ernest Shackleton's 1914-1917 Ross Sea Party, another failed exploration whose members were forced to live in Scott's hut after their ship blew out to sea. The CNN story has more information. There are tiny organisms living deep below Earth's surface. A lot of them! They may make up 6 percent of all life on Earth, but scientists still don't know how they survive down there. Four animals previously unknown to science have been discovered in deep water off Scotland. New species of large sea snail, clam and marine worm were found during surveys by Marine Scotland. And finally, from the BBC, here's a gallery of award-winning microscope pictures - a reminder of the unseen wonder all around us. How can someone help in the medical search for a treatment for AIDS, without being a research scientist in a lab or a doctor in a hospital? There's a new way now to be part of medical research, and it includes people who have no medical training at all. This kind of citizen science requires access to a computer, and an interest in playing games. This picture from Foldit is a model of a streptococcus molecule. The game used to help in the search for an AIDS treatment is called Foldit -- click here to go to their website and learn how this game shows different ways that proteins can be folded. To put it simply, proteins are long molecules that aren't just straight like beads in a necklace. Proteins are folded into crooked shapes. 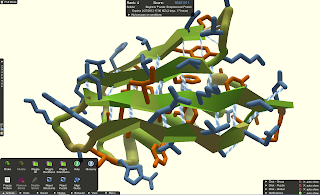 Some proteins are useful when folded in a certain way, but not useful when folded a different way. This picture from Foldit shows the same model, unfolded. 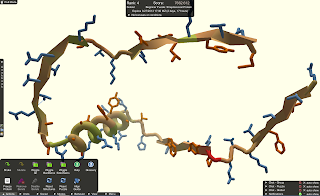 There's an article by Ed Yong describing how the game Foldit was used to solve the shape of a particular protein. It turns out that no matter how good a computer program is at folding shapes, people are still better than computer programs at picking the right places to try small changes. People playing Foldit took three weeks to solve a question about one particular protein that AIDS researchers have been studying for years. Citizen science is getting to be pretty popular these days. There are many ways for ordinary citizens to assist trained scientists in the gathering of data, such as the volunteers who assist in bird-banding programs. An international website allows people to report finding a bird with a band around its leg. There are other programs such as Neptune, where people can log in to observe a few minutes of video (or hours, if you prefer) recorded at the bottom of the ocean near Vancouver Island, and alert the researchers about anything interesting that happens at particular points of the video. At Sci/Why, we wrote about a teenager who made a discovery on Neptune video. For origami fans, there are other scientific discoveries about this art of folding. One recent invention is a sheet of plastic that can fold itself into two different forms -- check out this article from Scientific American magazine! Another article in Scientific American notes that other kinds of plastic origami might be useful for shaping cells into tiny containers for future medical uses. Ok, I admit it. Despite the fact that I've written a popular Christmas book (A Porcupine in a Pine Tree), December is not my favourite time of year. I hate cold weather - my fingers turn blue and my toes---let's not even mention my toes. So I tend to head to warmer climes in December and get my Ho Ho Hos at Hot Springs and the like. Earlier this month, I visited northern Peru. I was delighted to find the Amazonian basin decorated to the hilt for the holidays! Of course, it's always decorated to the hilt - with incredible butterflies, hummingbirds, orchids and more. The remote Chachapoyas area is one of the most interesting and diverse ecosystems on Earth. Tropical cloud forests drape the Andes mountains, which break up the region into zillions of distinct microclimates. Hundreds of separate habitats are home to unique species that have arisen in isolation. The rare clearwing butterfly has absolutely transparent wings. In these species, the scales that gives butterflies their colours are confined mostly to their wing veins. The glassy wing makes the insect a spectacular sight when perched on a leaf or flower; it's virtually invisible in flight. And by the way, don't eat these fluttery gems. They're highly toxic. Unlike other poisonous butterflies that tank up on toxins as caterpillars, clearwings obtain their poison as adults. They drink nectar from flowers containing toxic pyrrolizidine alkaloids for a powerful defense against hungry birds. The Spatuletail Hummingbird is one of the rarest hummingbirds in the world. It lives only in Peru, and only on the east bank of the Rio Utcubamba. According to Bird-life International, there are fewer than 1000 of these remarkable creatures left in the wild; they are on the "Red List" of endangered birds. 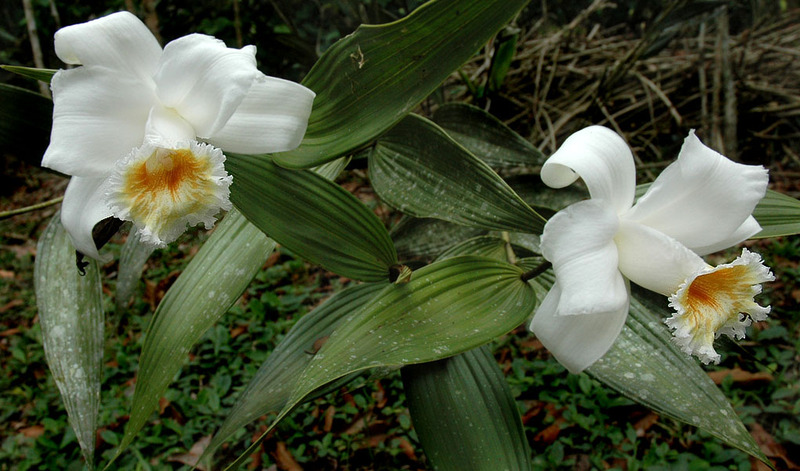 Unlike most orchids, this stunning species is terrestrial, and grows only on rock. You can't remove it from its substrate either; if you wanted to transplant it, you'd have to take the rock too! The final ornament in this post brings us to yet another microclimate and mini-habitat: the lowland "jungle" around the Huallaga River. 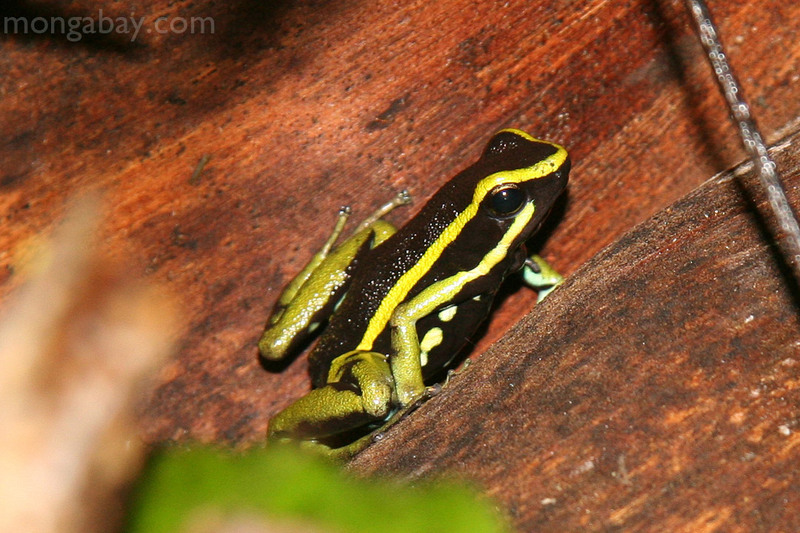 Here's where you find the iconic Three-Lined Poison Dart Frog. Beautiful but deadly so do not touch!!!! 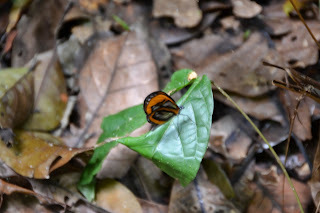 My idea of a happy holiday is basking in the warmth and beauty of the Amazon. I've enjoyed sharing these rainforest gifts with you, and hope you all enjoy a happy holiday too, wherever you find yourself. But more about that them later. Most reindeer roam the forest and tundra of Scandinavia and Russia and other parts of northern Europe and Asia, as far east as eastern Siberia and northern China. There’s even a small herd of reindeer on a mountain in Scotland. In the same kind of habitat in northern North America, you find caribou. They look like reindeer and behave pretty much like reindeer. So what’s the difference? Essentially none, says Don Russell, a Yukon caribou biologist and founding coordinator of the CircumArctic Rangifer Monitoring and Assessment Network (CARMA), an international organization concerned with the state of the Arctic's wild caribou and reindeer. "The reindeer is just an Old World caribou. They are the same species, Rangifer tarandus," he says. And they're the dominant large herbivore, or plant-eater, in the circumpolar ecosystem. In fact, in most parts of the North, they're the only large herbivore. That’s not to say that all reindeer and caribou are identical. There are quite a few variations in body shape and appearance, but those variations depend more on the kind of habitat the caribou and reindeer live in than what continent they come from. There are three general groupings of reindeer and three matching groupings of caribou. 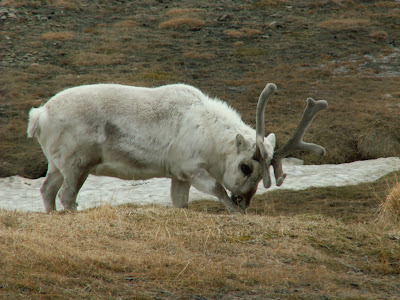 Marine reindeer and the very similar Peary caribou of northern Canada live on Arctic islands or near the Arctic coast. Tundra reindeer and barrenground caribou tend to gather in large herds and migrate across vast swaths of territory, mainly north of the boreal forest. Forest reindeer and woodland caribou live in the northern regions of the boreal forest itself, usually in smaller herds than the tundra animals. 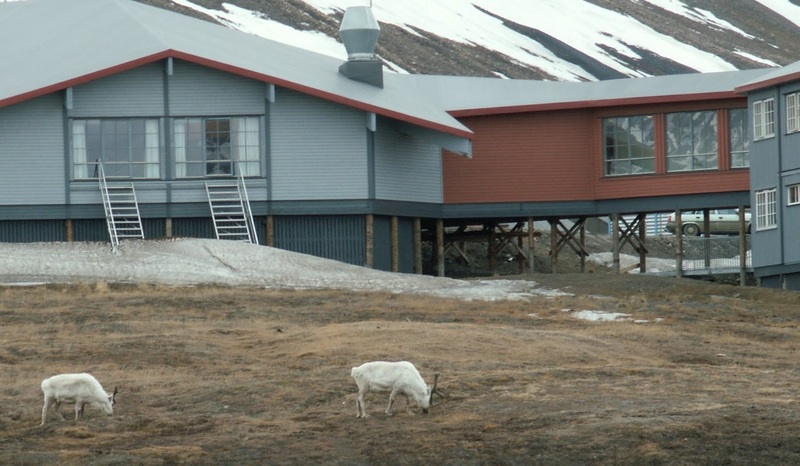 town on the Norwegian islands of Svalbard, are actually wild animals. We tend to think of reindeer as domestic animals, but that's not always the case. True, people in Scandinavia and Russia have been keeping domesticated reindeer for thousands of years. However, one of the world’s largest herds of wild Rangifer tarandus is the Taimyr reindeer herd, which lives on the Taimyr Peninsula in central Siberia and numbers many hundreds of thousands of animals. The caribou of North America have never been domesticated, but not because they are genetically different from reindeer. The aboriginal peoples of North America simply never felt the need to domesticate caribou. Instead, they adapted their lifestyle to fit the seasonal wanderings of the wild herds. Perhaps the oddest member of the Rangifer tarandus tribe is the Svalbard reindeer. Russell calls it the Shetland pony of the reindeer world. Svalbard is Norwegian territory, a small group of rocky islands about halfway between the Norwegian mainland and the North Pole. Isolated by hundreds of kilometres of ocean from any other land, Svalbard is home to a distinct population of reindeer, small, with short legs, snubbed muzzles, and chubby, barrel-shaped bodies. on the islands of the remote Svalbard archipelago. In winter, Svalbard reindeer have to eat whatever they can find. Most other Rangifer eat lichens, which are available in winter under the snow. On Svalbard, however, there are few lichens. Svalbard reindeer eat the first green shoots of sedges emerging in the spring. Through the summer, they work their way through lush tundra plants, packing on as much fat as possible. The fat has to last them through the lean times of winter when they go on a crash diet, often losing almost half their autumn weight by spring. Meanwhile, about those flying reindeer. They seem chubby enough, but science has remarkably little to say about them. Perhaps it's the shortage of confirmed sightings. Nevertheless, given their unusual reported characteristics (flying, occasional appearance of a glowing red nose), they clearly deserve more research. If you want to know more about wild caribou and reindeer, explore the CARMA website. To hear from the people who depend on caribou and reindeer -- in their own words -- watch some of the videos at Voices of the Caribou People. It's a great resource for teachers and students studying life in the Arctic. About those seasonal reindeer.... Here's a site devoted to the history of Santa Claus and his flying Rangifer team. And the one with the unusual nose? That'd be Rudolph, eh? Finally, remember those reindeer on a mountain in Scotland? Here they are, the Cairngorm reindeer. Hair ice growing from twig. My friend Ulli called one chilly morning a couple of weeks ago and said she’d found a stick in the woods for me. “A stick?” I said. “You want it,” she said cryptically. She was right. Though what she brought over ten minutes later looked like an ordinary piece of a dead alder branch, part of it was not ordinary in the least. One end had sprouted a glorious tuft of long silky white hair. Ulli had found hair ice! Though you might think at first glance that hair ice is some kind of peculiar frost – it’s not. Frost forms when moisture in the air freezes on objects. Hair ice, on the other hand, starts from the inside and moves outwards. Moisture in a stick or twig is exuded through minute pores on the surface, and when this moisture hits humid sub-zero air the result is very fine filaments of ice that can grow up to five centimeters in length – filaments that look just like hair. It’s an uncommon phenomenon, and not just because weather conditions must be absolutely perfect. 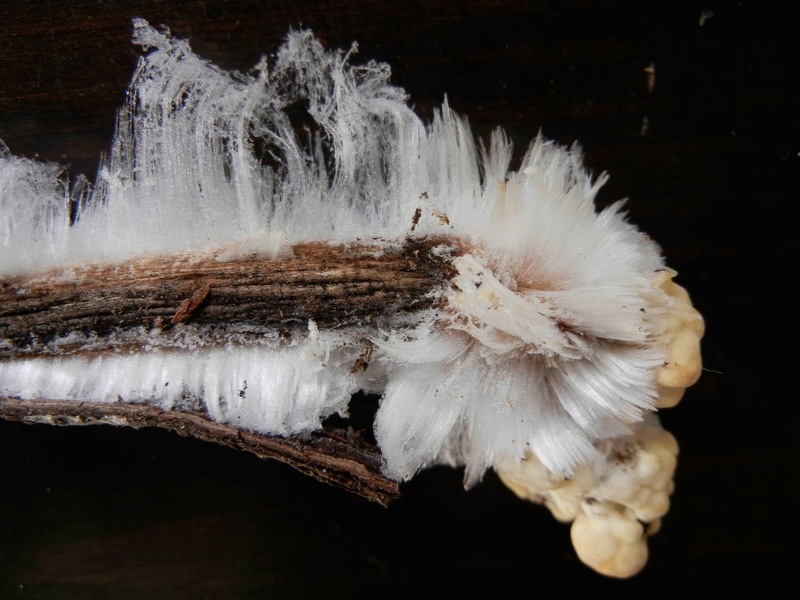 Here's the real glitch: the appearance of hair ice seems to be dependent on, of all things, fungi. So what do fungi have to do with it? The idea that “a fungus participates in a decisive way” in the formation of hair ice, was first suggested in 1918 by the brilliant interdisciplinary scientist Alfred Wegener (who developed the theory of continental drift), but was unproven. Recently though, Gerhart Wagner and Christian Mätzler from the University of Bern have been studying "haareis" and its relationship to fungi. In one experiment they collected a number of twigs that had previously grown hair ice and treated them variously with three agents known to suppress the growth of fungi – heat, alcohol, and fungicide – while keeping a portion of each twig aside as a control. Afterwards, they froze all the samples under identical conditions, then compared the results. Sure enough, only the untreated pieces re-grew luxuriant manes of ice. The two scientists theorize that the living mycelium of various fungi within the wood (i.e. 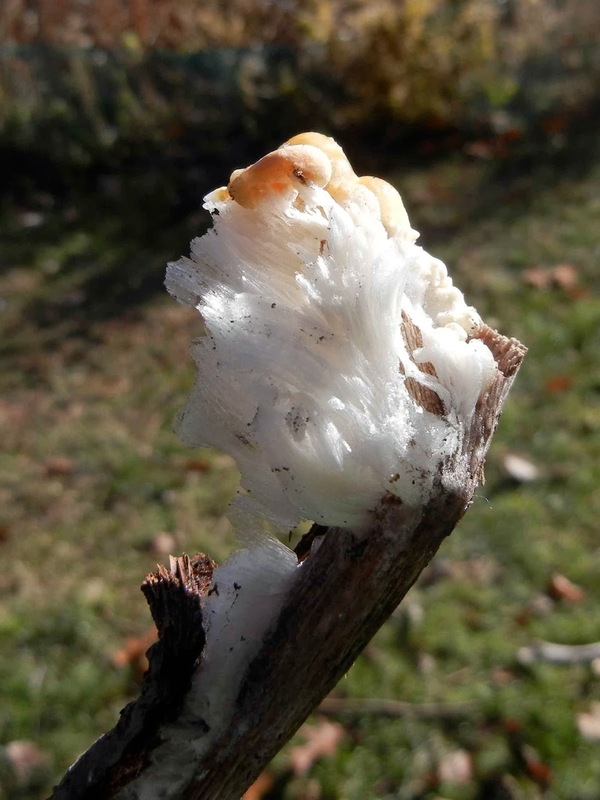 Exidia glandulosa or Tremella mesenterica) continues to metabolize at near freezing temperatures, producing heat and gases that force moisture outwards. When this moisture escapes through pores and comes into contact with humid below-freezing air, hair ice grows. After reading about Wagner and Måtzler's success at coaxing hair ice to grow in the laboratory, I decided to try to try a simple experiment of my own. I soaked the stick Ulli had brought me in water (its original hair ice having quickly melted). I then laid it on a wet paper towel on a plate and put it out in our unheated boot room, then waited for the temperature to drop. By the 10:00 pm the whole stick was sprouting hair ice. By morning I had a new pet! I’ve heard it several times – haunting, otherworldly sounds caused by ice expanding and contracting, which is most common when there are major fluctuations in temperature. The best sounds, and the ones that carry the furthest, occur when there is no snow cover – rare conditions on the lakes near where I live, but not unheard of. Listen to Andreas Bick’s extraordinary recording of this phenomenon on a lake in Germany here. Turn up the volume and brace yourself! 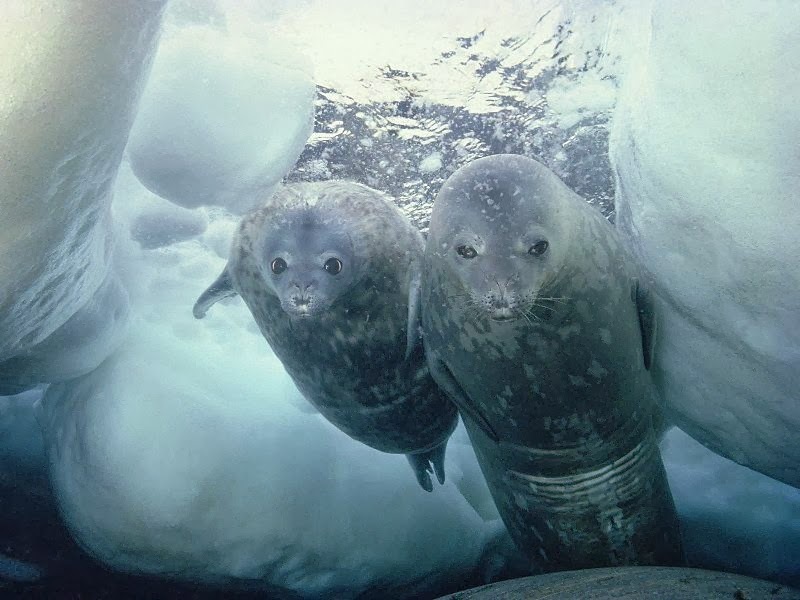 Weddell seals whistle and chirp. And then I discovered something even more wonderful: The Alfred Wegener Institute (yes! that's the same Alfred Wegener as mentioned above!) that co-ordinates German polar research in both the Arctic and Antarctic has an acoustic laboratory in Antarctica. They are always recording – and on their website they offer this MP3 audio livestream of Antarctic ice and animal sounds from near the Neumayer Station on the ice shelf of Atka Bay. You can listen to the under-ice sounds of the Antarctic in real time! I can't turn it off! All of this icy stuff is so cool it warms my heart. This page from the Alfred Wegener Institute has sound files of various seal and whale noises to listen for on the live audio feed, as well as rubbing ice, singing icebergs, and some “mystery” sounds that are truly astonishing. Download Gerhart Wagner and Christian Mätzler"s paper, "Haareis auf morschem Laubholz als biophysickalisches Phanomen" or "Hair Ice of Rotten Wood of Broadleaf Trees – A Biophysical Phenomenon" – lots of pictures, though only some parts are in English. I just returned from three months of exploring the Australian continent. Landing in Sydney on the east coast, we drove 16,000 km in a rented camper, then took the train across the Nullabor Desert for 2 days and 2 nights, flew to Tasmania and drove all around that island. We saw and learned a lot! The first recorded arrival of white men on Australian soil, was on a Dutch trading ship, under the command of Captain Dirk Hartog, arriving on October 25, 1616 - more than 150 years before Captain Cook. Hartog left a pewter plate, nailed to a post. The original plate is now back in the Rijksmuseum, but there’s a replica of the plate in a town called Geraldton on the west coast. On the west coast, we visited a resort called Monkey Mia. There are no monkeys here. It is believed that the name originates with a boat called The Monkey that used to frequent the area. Mia means home in an Asian language. Before going, I talked to many people who had visited this resort where wild dolphins come to interact with people. Everyone said it used to be fun, but that now it is very touristy and regulated. But still. When wild dolphins come to shore, I wanted to experience that. I did not have high expectations. I also suspected it to be commercialized. BUT it was fun! It’s done in a lovely manner. You do have to pay a small entrance fee, but that is often the case at wildlife or nature reserves. The rangers gave a informative talk and the bottlenose dolphins arrived around 8 AM. No one makes them show up, they truly do live free in the ocean. Of course they have been conditioned, know that there is a treat waiting by the shore. But I do believe the regulations are in the dolphins best interest. If they did not strictly enforce rules, people would feed them all sorts of stuff including bread, or worse. They would touch them and affect them with sunscreen or bacteria. Now, we all had a long, good look at the six wild dolphins that came to shore. They almost beached themselves and showed off. One mother brought a small calf. It was lovely. A few people were allowed to feed a fish to them and then it was over. 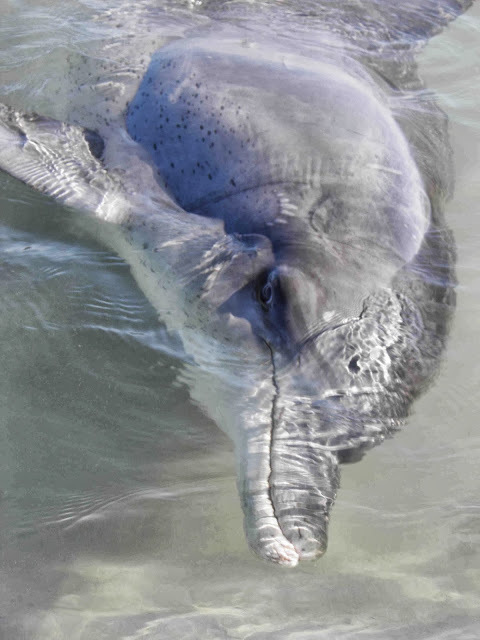 The dolphins come back as they please but are only fed in the morning, and only up to five females, bringing off spring, males and other friends along. Bottlenose dolphin coming in to socialize. Monkey Mia is part of a much larger preserve, a UNESCO World Heritage area including Shark Bay, Shell Beach, Hamelin Pool and a few other special areas that deserve preservation for future generations. On Christmas Eve, one hundred years ago, right where you are now, a child just like you might have been wrapping a present. To do so, they would need some brown paper, scissors, and a burning candle. First, the paper was cut and folded around the present. Then, hot wax from the candle was dripped between the paper’s edges. The paper was held together with a finger until the wax cooled and became smooth and hard. The wax had turned from liquid to solid. The solid wax stuck to the paper, and kept the edges together. A bit of ribbon was added to make the package pretty. People do not usually use wrap gifts with candle wax anymore. It is dangerous, and messy. In 1930, an American inventor named Richard Drew made wrapping gifts simpler and safer when he invented “sticky tape.” Part of his job for the company 3M was to play with sticky stuff and see what he could invent with it. Sticky tape was the result. Now, all over the world, whenever people want two pieces of paper to stay together, they use a piece of tape. No candle required. Tape is a long strip of plastic with a layer of glue on one side. Only one side of tape – the side with the glue – is sticky. The other side has to be smooth so the glue does not stick to it, and we can unroll it. The smooth side is the side that we touch with our fingers. When Richard Drew was thinking about how to make tape, a clear, thin plastic called cellophane had just been invented. Cellophane, also known as plastic wrap, was first used to cover leftovers in the kitchen. It is cellophane that Richard Drew used to make his see-through, sticky tape. Tape might be simple to use, but it is not simple to make. Richard Drew had to be very patient and he tried many recipes in his search for the perfect glue. More than thirty different ingredients are in sticky tape glue. Some of these ingredients are oils and some are plastics. All these ingredients were mixed together and tested until the glue was just right. Glue that is too sticky would not come off the roll. Glue that is not sticky enough would not hold things together. Sticky tape glue works so well because it gets stickier when it is pushed down with your fingers. It is “pressure sensitive.” It comes easily off the roll, and then when you press it onto the paper, it stays there. When fingers apply pressure to tape, it affects the molecules in the glue – it squishes them against the surface, causing them to spread out, just like squishing a jelly sandwich makes the jelly spread out. The glue – and the jelly – is flowing slowly, like a liquid. The harder the molecules are pressed against the surface, the more they flow, and the more they stick. Tape sticks best to paper, glass, and metal. It does not stick as well to plastic like yogurt cups. Try it yourself; is it easier to get a piece of tape off glass, or a yogurt container? 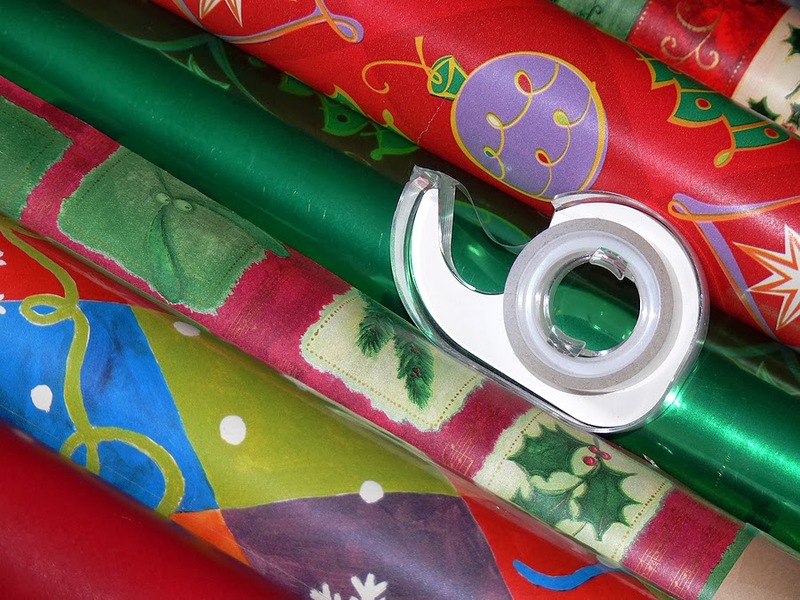 The next time you wrap a present, remember you are squishing molecules with your finger. You and your fingers are an important part of the tape’s stickiness. The science of sticky tape is complicated. It has taken scientists a long time to understand how pressure sensitive glue works, and they still don’t have all the answers. There have been whole books written about the subject! This is one invention that works well, even though we do not fully understand how. It reminds us that even simple things can be full of surprises. Just like that Christmas present waiting for you under the tree. Who's that chit-chatting outside my door? When I went to the Nature House at Elk/Beaver Lake, I expected to use my science talents, but I never expected to meet a new neighbour. A small neighbour, and new to me but a long-time resident of the area. First sign of the little neighbour was a loud, repeated "CHIK!" sound from outside and behind the Nature House. I put down my gear -- a folding inflatable kayak in its bag, and a small drybag holding my wallet and spare dry shirt -- and walked round to the back of the Nature House. Up in a poplar tree was a small animal running from branch to branch, occasionally pausing to declare "CHIK!" in indignant tones. Eventually I saw glimpses of it through the branches. It wasn't a bird as I'd thought; it was a furry four-footed animal. It wasn't a squirrel, either a red squirrel or a grey squirrel. Squirrels have long bushy tails. It wasn't a rat, either -- this animal's tail was shorter and furry, not long and bald. This little animal had a neat small head, and its furry coat was dark on the back with a white underside. I watched it scurry high in the branches, scolding another animal that was unseen; perhaps it was scolding a crow or raven. Then I went into the Nature House, curious to figure out what I had seen. It was time for a little simple science research. But with no computer access to the internet, it was time to hit the books. This photo is from ZooChat.com - check out their website! First book I found on the Nature House shelves was Mammals of British Columbia. It's a great resource, with photos as well as descriptions of the animals and their habitats. The second book I opened was Carnivores of British Columbia. I had an idea what kind of animal this might be. The sound this animal made reminded me of the sound I'd heard a baby river otter making on a seashore one day, and otters are carnivores. I wondered what kind of animals are related to otters, and are found in trees? Was this animal a pine marten, or maybe a fisher? It wasn't anywhere near big enough for either. The little animal turned out to be the smallest member of the mustelidae family: a least weasel. How wonderful it was to see this neat, bright little animal in the photos, and match it to the little fellow scrambling quickly through the trees. Small books like the ones in the Nature House or the public library are so useful for understanding more about our animal neighbours. I'm so glad that when I heard the sound of the weasel in the tree, I didn't just assume it was one more crow among many. Later at home, I was able to find all sorts of interesting websites that can help us figure out what animals we're seeing in the woods, or traces that animals leave behind. 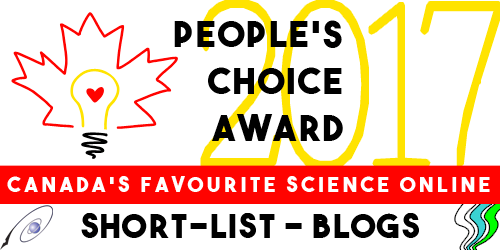 One of them is the Canadian Museum of Nature website, which has lots of resources for learning a little or a lot. And it's bilingual! The University of British Columbia has posted a list of animals. Canadian Geographic magazine, which has many educational materials available, has a website listing animal fact sheets for free download in English or French. And the Ministry of the Environment has a website that's an Identification Manual to the Small Mammals of British Columbia, with a link so that you can download the entire manual and print it if you like. This manual is really detailed, right down to five drawings detailing key differences among chipmunk genital bones. 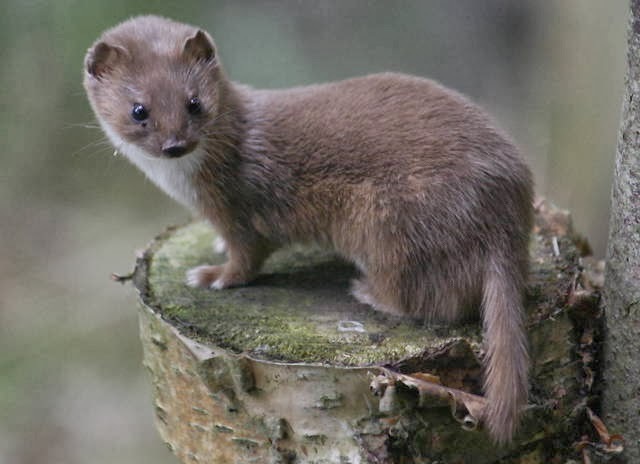 That's a little more detail than I needed to identify my neighbour, the least weasel. So What DOES The Fox Say, Anyhow? Sci/Why alum L. E. Carmichael was on TV last week, talking about domesticated foxes and her new book, Fox Talk: How Some Very Special Animals Helped Scientists Understand Communication. Lindsey's book is available in soft and hardcover editions from Chapters, Amazon, or your favourite independent. If you're interested in the enhanced ebook, consider buying it direct from the publisher, with a bonus stuffed fox! Just about this time of year, back in 1930, one of the most famous figures in modern geology lay down to die on the snow-covered ice cap of Greenland. On November 1, Alfred Wegener celebrated his 50th birthday with friends at a tiny, temporary meteorological station on the glacier. The next day, he and one companion - a young Greenlander named Rasmus Villumsen - hitched up the sled dogs and headed back to the coast to rejoin their main party. They never made it. In the spring, his friends found Wegener's body, laid out carefully on a reindeer hide and buried in snow. Villumsen was never found. Today, Wegener is a celebrated hero in the world of geology, but that wasn't true when he died. Then he was a meteorologist and polar scientist with a weird idea that drove many geologists into a frenzy. 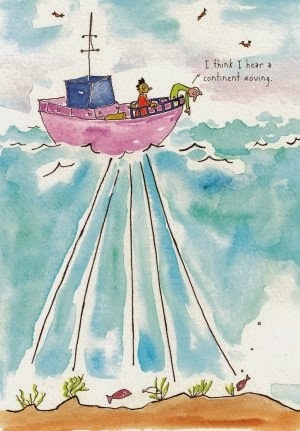 The continents, Wegener said, weren't stuck in place. Instead, they moved - ever so slowly - around the globe, breaking apart to create oceans and coming together to create mountain ranges. 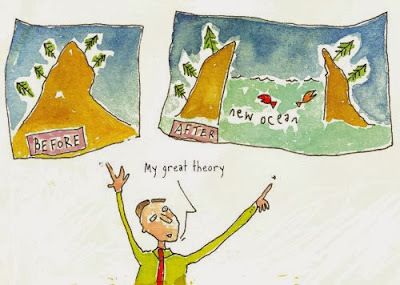 He called his theory Continental Drift. Most geologists hated the idea. They couldn't see how continents could move (and Wegener couldn't explain that either), and they were deeply offended that a mere meteorologist would stick his nose into their science. By the time of his death, Wegener had been amassing evidence and arguing his theory for 20 years without convincing them. It would be another 30 years after Wegener's death before the geological world took him seriously. What it took was the discovery of a mechanism that explained the movement of the continents. Mapping the sea floor with sound waves. One of the first to recognize the mechanism was an American geologist, Marie Tharp. In 1952, an American survey ship was trundling up and down the Atlantic Ocean, using new technology involving sound waves to study the ocean floor. Back in the lab, Tharp was drawing ocean-bottom maps based on the ship's data. She spotted a formation more familiar from land - a rift valley, created when two bits of earth's crust pull apart. And it meant, she realized, that the ocean bottom was spreading, getting wider. That meant that the continents on either side were moving apart, just as Wegener had said. It took months before Tharp could convince her colleagues that the ocean really was growing wider. Even then, most geologists still considered Wegener sadly mistaken - at best. One of the scientists who took the evidence of ocean spreading a bit more seriously was Canadian geologist and physicist John Tuzo Wilson. He later said it took him almost a decade to accept the idea that the continents move, but once he did, there was no stopping him. Tuzo Wilson realized that Earth's surface is made up of massive plates that move around, pushed and pulled by the forces in the planet's molten core. He pioneered the study of what is now called plate tectonics in a now-classic 1965 journal article called "A New Class of Faults and their Bearing on Continental Drift." It was the vindication and elaboration of Wegener's much-despised theory from 35 years earlier. And if Wegener hadn't died on that remote icefield in 1930, he might still have been around - a hale and hearty 85-year-old - to enjoy the triumph. The story of Alfred Wegener and Marie Tharp and a few others is in my new book, Before the World Was Ready: Stories of Daring Genius in Science (Annick Press 2013). There's plenty of information about Wegener on the Internet. Here's a good site, with links about different aspects of plate tectonics. And here's a lovely bio of Marie Tharp, in her own words. John Tuzo Wilson was a science communicator as well as a scientist. He spent more than a decade as director general of the Ontario Science Centre in Toronto. Here's a short biography of J. Tuzo Wilson (as he was usually called), and here's a longer one. Picture this: You’re in an unfamiliar part of the woods, alone. It’s spooky and dark. A storm is brewing. You hear something, stop dead in your tracks. Was it a howling wolf? Or just the wind? You’re alert now, all your senses are alive. And then you get a whiff of something—something so awful it makes your nose curl: the stench of rotting flesh, a nearby corpse. But where is it? And then you see something…but it's not a corpse, though it's almost as grotesque. What you’ve found is a stinkhorn. Stinkhorns are one of the more wondrous fruits of the fungi kingdom. They come in a bizarre variety of shapes, ranging from cage-like structures to tentacled stars that look like space aliens to rude-looking columns, some of which are dressed in lacy hoop skirts. Whatever their form, they all erupt—sometimes overnight—from an “egg,” and they all, at some point in their development, are covered in gross-smelling slime. More traditional fungi rely on air currents to disperse their minute spores. Not the stinkhorn. 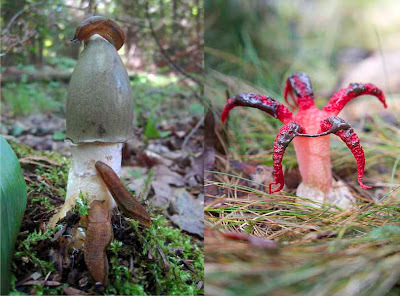 A stinkhorn’s spores are imbedded in its stinky slime, disgusting muck that so closely mimics the smell of a decomposing cadaver it quickly attracts flies and other insects. When these insects take off again, they unwittingly carry away the stinkhorn’s spores stuck to their mouth parts and their tiny insect feet, spreading them far and wide. 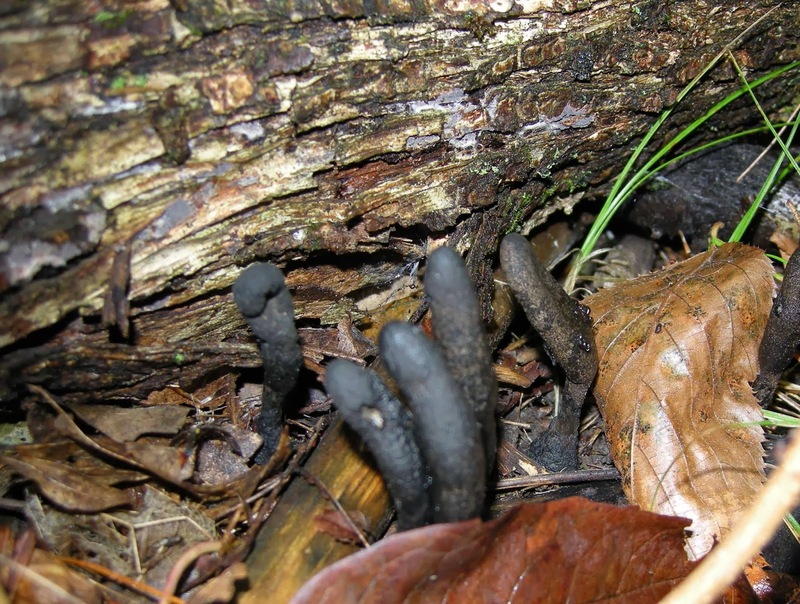 Properly called Xylaria polymorpha, these fungi are hardwood decomposers. 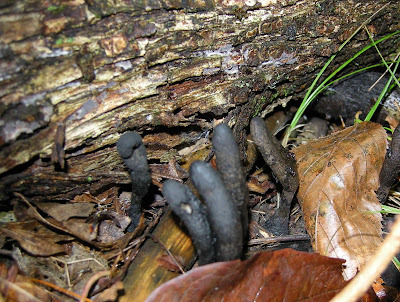 They’re most often found on rotting logs, but when they grow from buried wood they can eerily resemble the blackened fingers of a corpse struggling to dig its way out from a forest grave. Unlike stinkhorns, which can pop up and then deteriorate in a couple of days, Dead Man’s Fingers are so horny and tough they can persist for months, or even years. 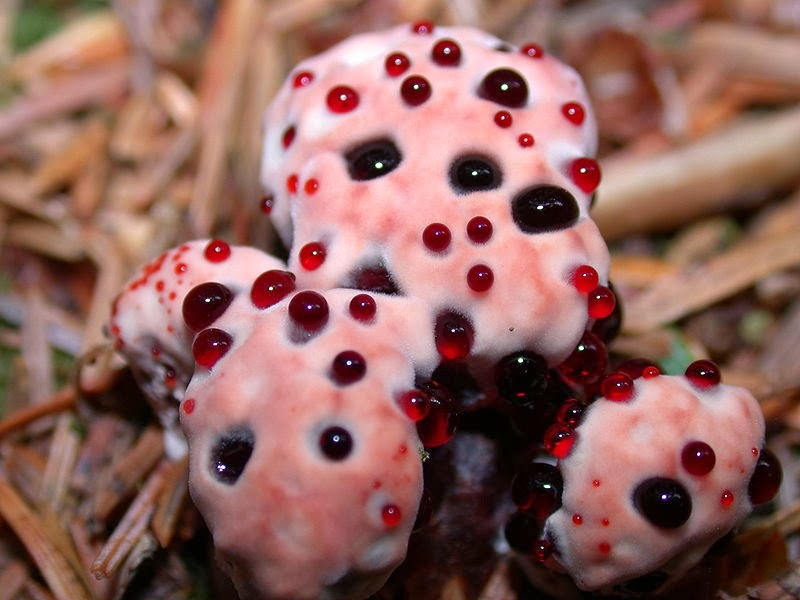 And then there’s the Bleeding Tooth fungus. The first time I stumbled upon one of these, it was so covered in “blood” I thought I’d found something recently killed. Though Hydnellum peckii, when fresh and moist, exudes something that looks shockingly like what oozes out of a slaughtered animal’s veins, the globules of pigment-filled liquid are nothing like animal blood. There is, however, a compound in these fungi that can affect blood. This compound, called atromentin, has anticoagulant properties similar to those of heparin, a medication used to prevent blood clots. Ominously, though, an overdose of these anticoagulants can cause a patient to bleed to death. The fungi world provides even more Halloween-appropriate characters. In daylight, some of these look like perfectly normal mushrooms. 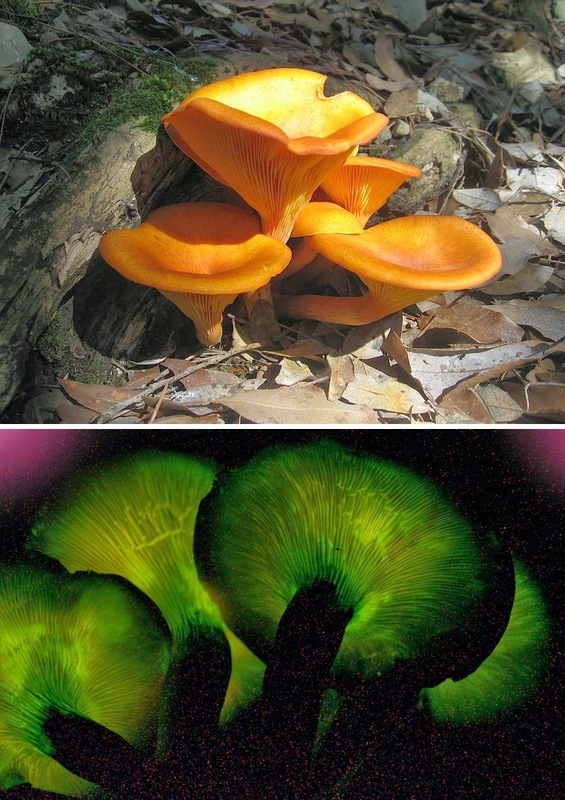 But if you happen to be out for a midnight woodland stroll without a flashlight, you might be frightened by an eerie glow emanating from the base of tree—a glow produced by bioluminescent fungi. Scientists don't yet know why more than 70 species glow in the dark, but one idea is that their light might attract nocturnal insects that could help spread the mushrooms' spores. But the prize for the most frightening, the most macabre, the most fiendishly devious fungi has to go to the Zombie Ant Ophiocordyceps. 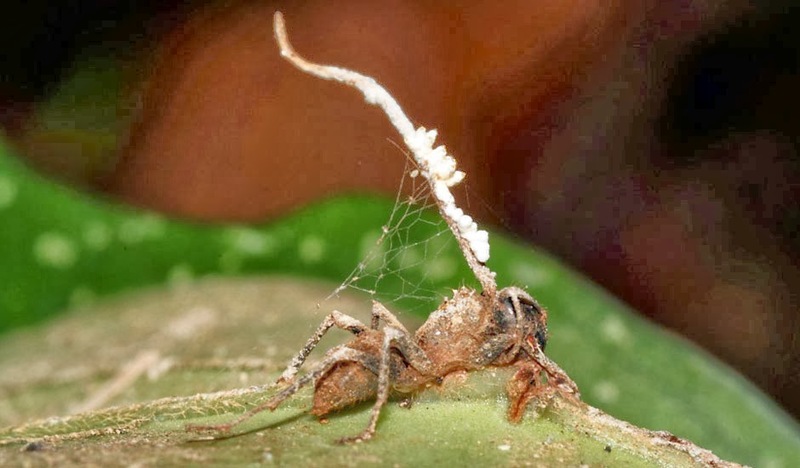 The Cordyceps family of fungi are parasites, and their chosen victims are often insects. But what makes Ophiocordyceps so unforgettable, and so nasty, is that after it has worked its way inside an ant's body, it travels to its brain, where chemicals are released that control the ant's actions. The now "zombified" ant is compelled to walk a distance from its colony, and eventually latches tightly onto a leaf with its mandibles. It will never let go. The fungus continues to grow, killing the ant and producing a fruiting structure that sprouts straight up out of the insect's head. The fungus then produces spores that are dispersed by air currents, so the fiendish cycle of Zombie Ants can continue. But, wait! There's some comeuppance for the dastardly Omphiocordyceps: a completely different parasitic fungi preys on it, reducing its ability to produce mature spores! Labels: ant, atromentin, Cordyceps, creepy, David Hughes, Dead Man's Fingers, eerie, fungus, Halloween, Hydnellum peckii, macabre, mushrooms, Omphalotus, ophiocordyceps, parasite, stinkhorn, Xylaria polymorpha, zombie. She reached up, touching the cold ceiling above her head, relishing the grain of stone beneath her fingertips. The lamp flickered. Shadows raced across the cave walls, spirits running through time. She hoped there was enough fat in the lamp. It would be difficult to find their way out, and she was afraid of what might press close in the darkness. He was coming toward her. She was silent. It was easy to be, here; the walls were always talking. He stood beside her, holding a half clam shell filled with red, thin like new blood. He held it close to her hand, up near the rock. He put the end of a bone of a dove into the red, and blew, through the hollow. His breath mingled with the fluid. It bubbled and whistled. The spirits whistled in reply. She felt the red against her hand’s flesh, cool and soothing, not hot like the blood of a kill, the blood of death. Her hand was steeped in it, her knuckles smooth under the coating. The light of the lamp flared and for a moment, her skin glowed. The red pulsed through her, inside her, and outside her. She peeled her fingers away from the rock with sadness, breaking the union between the past and the present. On the pale rock she’d left an imprint, a pale hand, five rays. A part of her to remain with the spirit shadows, a manifestation of her moment. All of us share this imaginary CroMagnon woman’s compulsion to create, though we cannot understand the significance of her hand print, made deep in a cave some 40,000 years ago. We can say, however, that just like her hand print, what we create also leaves an imprint of ourselves on the physical world. At its core, creativity is about self-expression. Creativity is also, at its core, a manipulation of the world around us. Not only do we make our inner self external when we create, but we also interact with the external in a personal way. Creation is an act of giving and also an act of receiving. I create because it is a way to give that is comfortable; it does not require thanks, and it has no strings attached. It is safe. When someone judges my hand print, they are judging not just my gift but my desire to give it. I create because the parts of me made external become a part of my world, a friendly part, that I can interact with, and receive from. I have forged connections with my surroundings, I am not so isolated. When someone judges my hand print, they are putting a value on the parts of me made external. They are changing the dynamic of my interaction with them. Judging a creative product is important. To give requires a receiver. And understanding what we have expressed of ourselves is aided by understanding what others have perceived. However, it is never a task to be taken lightly. 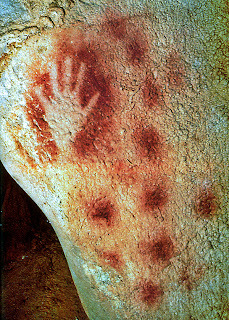 Even the simplest of creations may be imbued with meaning for the creator, and that meaning is not always accessible to others, like hand prints on a cave wall. I really enjoyed exploring the website (see Brainspace below), and that made me think about other children's magazines that cater to science interests. Owl Kids: For me, Owl magazine and its cohorts Chirp and chickaDEE, each geared for a specific age group, remain the standard for Canadian kids' magazines. 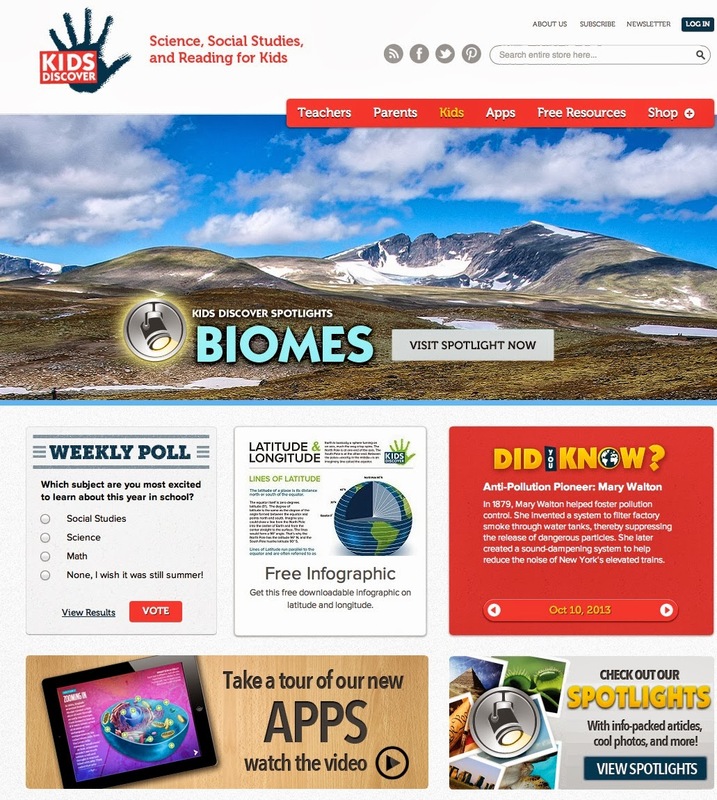 Owl, geared for nine- to 13-year-old readers, began as a nature and science magazine, but in recent years expanded its scope to include many other subjects and themes. It's been around for some 35 years, and it's still winning awards. Owl also has an attractive website with content to explore geared for kids as well as teachers & parents. For example, the World Watch section offers links to causes of all types, including science-related topics. 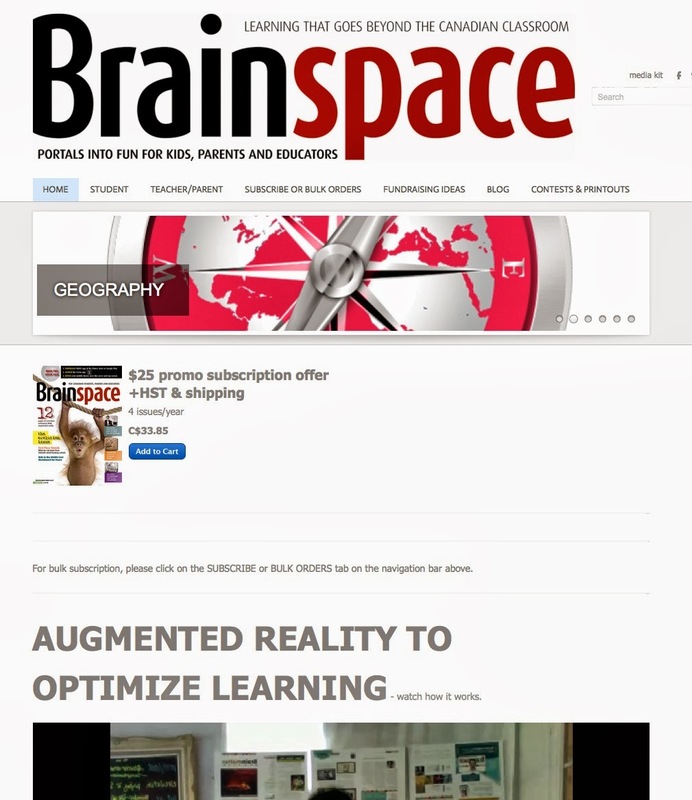 Brainspace: New kid on the block, Brainspace is available through a website offering videos, a blog, and special content for students as well as teachers & parents. This Canadian magazine promises to offer interesting articles on math, geography, technology, and more. If you've seen the September issue, please let me know: can the cover really talk? And how does it do that? In my opinion, there's always room for more magazines offering content designed for readers in specific age groups, especially when the articles cover science. When I searched for children's science magazines, I found lots of links. Odyssey: This is a science magazine designed for readers aged nine to 14, and the website says it intends to make its readers excited about science. Its topic range includes traditional school science subjects like physics and biology, as well as the environment, technology, and careers in the science fields. Odyssey is part of the Cobblestone & Cricket family of magazines. Cricket has many different magazines geared for various ages and interests offered through Carus publishing (US). 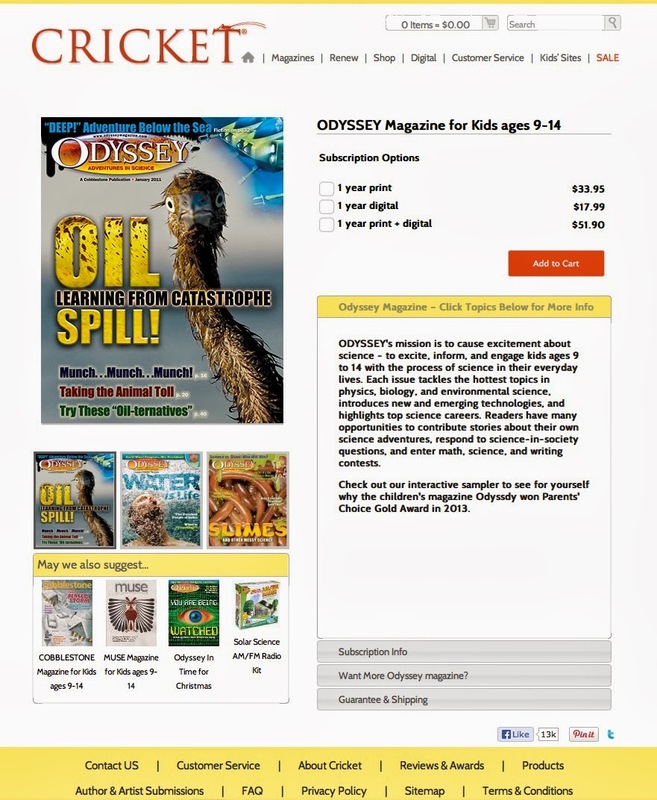 Each magazine has its own website, and the Odyssey site is full of interesting content and sample articles. 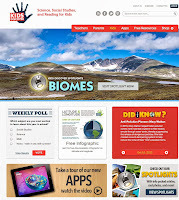 Kids Discover: While searching for magazines about science for kids, I came across this website. The Kids Discover website says it was started by a parent/publisher in 1991. It carries several science or science-related topics in its content list, from earth to space sciences. Do you have any favourite science magazines? Or any favourite magazines that have interesting articles about science? Please leave a comment -- and share a link! 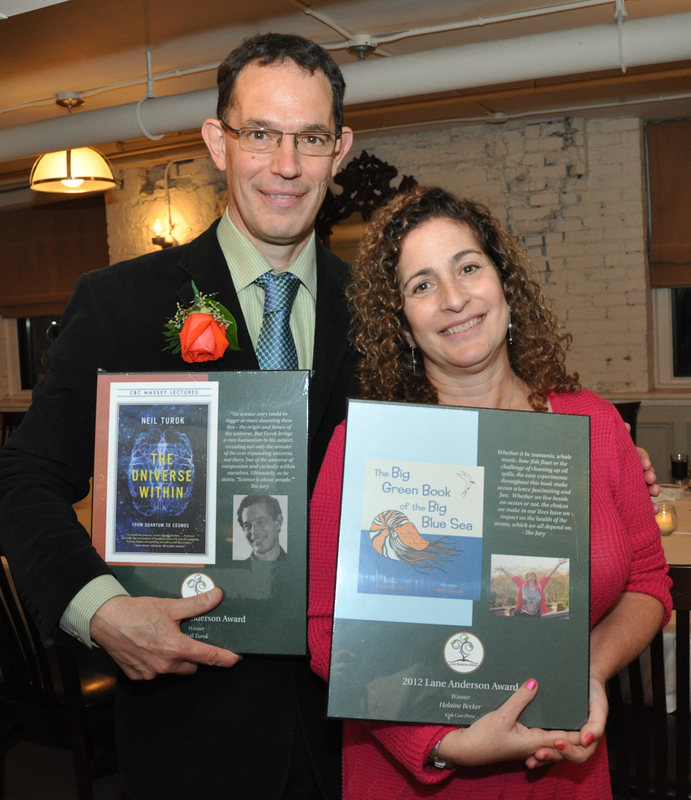 Marie Powell is the author of seven books for children, including Dragonflies are Amazing (Scholastic) and a new six-book series of Word Families books published by Amicus Publishing. Can you be just a little over the moon? No. 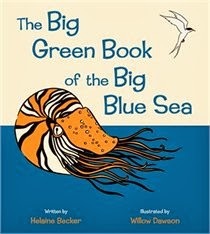 Which is why I'm a LOT over the moon to have been named the winner of the 2012 Lane Anderson Award for Science Writing, in the Children's Books category for The Big Green Book of the Big Blue Sea. 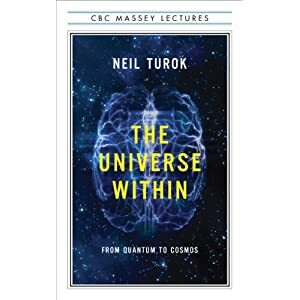 The winner in the Adult category is Neil Turok for The Universe Within. Here we are giddily clutching our plaques. Congrats to Neil and to everyone who participated in this great event! And a huge thanks to the Fitzhenry Family for endowing this award and highlighting the central role of science in our lives.